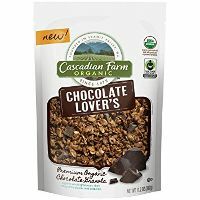 Premium Decadent Granola: We're probably not the only ones who have a love affair with chocolate. So when we found these delicious chunks of Fair Trade dark chocolate, we naturally paired them with our granola, baked in some extra chocolate, and added cocoa powder for good measure. We think you'll love it day or night as a handheld snack, as an ice cream topper, or hot or cold with milk. I love cascadian farm products! Cascadian farms is a fantastic vendor of organic frozen produce. I haven't tried their other products, but the frozen fruits and vegetables are fantastic!